LONDON, October 3, 2017 – The news is quite enough to send any addict reaching for a double espresso: global warming could be about to reduce the area suitable for coffee-growing in Latin America by up to 88%. The world’s favourite drink is produced by plants that are adapted to a precise range of conditions – and a world of rising global average temperatures could leave harvests in decline and established growers impoverished by mid-century, according to a new study. Researchers report in the Proceedings of the National Academy of Sciences of the USA that they used ecological models to estimate future changes in the distribution of arabica coffee plants and 39 species of coffee-pollinating bee in the world’s largest coffee-growing region. And if humans go on burning fossil fuels at the present profligate way, the areas suitable for growing coffee could drop somewhere between 73% and 88% by 2050. But the same study produced its own sweetener to ease the sting: bees may help reduce the losses. Although the same models show that the diversity of bees in areas suitable for growing coffee may be reduced by between 8% and 18%, at least 10 species of bee would be present to pollinate the flowers and set the berries in between 46% and 59% of the lands that will be suitable for coffee crops. The message of such studies is: don’t think about the plant, think about the ecological niche. The study suggests that although the picture is of overall decline, some mountain areas of Mexico, Guatemala, Colombia and Costa Rica could become more suitable for coffee as the global temperature rises. But it is a valuable crop and the main income for 100 million people, many of them poorer farmers and growers in the developing world. Only a few months ago researchers warned that climate change could put Ethiopia’s harvests at risk and last year scientists warned that extreme weather conditions and high temperatures could threaten 50% of Brazil’s crop. However, the researchers stress, the pollinators can help. Bees have a positive effect on coffee yield, on the fruit that is set and on the weight of the berries, and native bee species are often more effective pollinators than invader or introduced bee species. 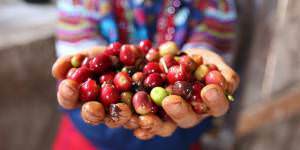 So the study offers a practical incentive to preserve species diversity and conserve natural ecosystems: that way nature delivers the breadwinning coffee bean and the honey as well.